A-listed Gairnshiel Bridge has suffered repeated damage from heavy vehicles, most recently just a day after reopening following repairs. It carries the A939 over the River Gairn, around six miles north of Ballater, providing an important road link between the Upper Deeside and Upper Donside valleys, then further north to Tomintoul in Moray and on to Speyside. The regular accidents have prompted calls for a long-term solution to protect the bridge, which was built between 1748 and 1752. Aberdeenshire Council has confirmed plans will be progressed for a new crossing over the River Gairn. It will be a single span structure of 32m and will be constructed east of Gairnshiel. 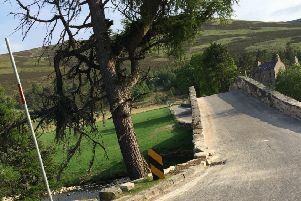 Councillor Councillor Peter Argyle, chair of the council’s infrastructure services committee and a local ward member, said: “It’s clear that action needs to be taken both to protect the beautiful and historic Gairnshiel Bridge and to make the route more accessible for modern traffic. Infrastructure services director Stephen Archer added: “Although many of the accidents have been relatively minor, each repair has an impact on this important structure and results in disruption to traffic. The proposals have been developed with input from fellow local ward members Councillor Geva Blackett and Councillor Paul Gibb. Councillor Blackett said she was delighted by the announcement. She added: “I am overjoyed that plans are now officially in place to provide a functional alternative to the beautiful Grade 1 listed bridge. The council aims to lodge a planning pre-application to the Cairngorms National Park Authority later this year. It is hoped the new crossing will be built in 2021.